Three students from Comal ISD have qualified for the Texas High School Rodeo Association’s (THSRA) Finals Rodeo for Region VI. They will compete June 8-15 in Abilene. Canyon High School senior Emily Becker, Smithson Valley High School junior Megan Miller and SVHS sophomore Hannah Wittig competed in 12 rodeos throughout the school year and consistently ranked in the top in their events, in order to qualify for the State competition. 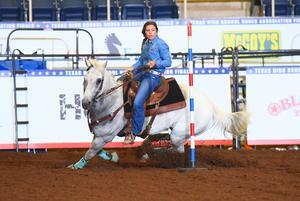 Becker has qualified in both pole bending and barrel racing. She earned 44 points in pole bending and 35 points in barrel racing. Wittig also qualified in pole bending with 40 points. Miller took first place in barrel racing with 78 points, winning the regional competition. Pole bending is a timed event featuring a horse and one mounted rider, running a weaving or serpentine path around six poles arranged in a line. This event is usually seen in high school rodeos and not on the professional level. Barrel racing is a rodeo event in which a horse and rider attempt to complete a pattern around preset barrels in the fastest time. 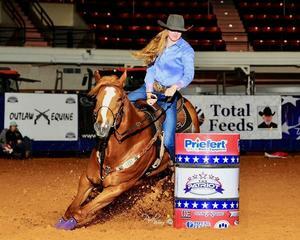 Barrel racing is primarily a rodeo event for women. It combines the horse's athletic ability and the horsemanship skills of a rider in order to safely and successfully maneuver a horse through a cloverleaf pattern around three barrels (typically three 55-gallon metal barrels) placed in a triangle in the center of an arena. Rodeo is just one more sport in which Comal ISD students participate as part of its Off Campus Physical Education program. -Smithson Valley High School junior, Megan Miller, won the Texas High School Rodeo Association's Region VI barrel racing and is headed to the State Finals Rodeo in June. 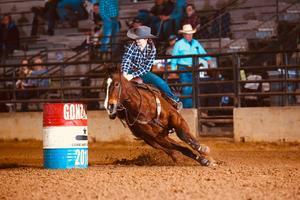 -Canyon High School senior, Emily Becker, qualified in both pole bending and barrel racing in the regional competition for the Texas High School Rodeo Association's Region VI and is headed to the State Finals in June. -Smithson Valley High School sophomore, Hannah Wittig, qualified in pole bending for the Texas High School Rodeo Association's Region VI competition and is headed to the State Finals in June.